Matching last season’s success will be hard to come by, considering St. Pete’s brings in a brand new coaching staff and returns only one senior. However, this team is the future of CYO basketball and is just going to have to trust the process. They have gone in a completely different direction from the sidelines and will look much different out on the court. Let’s see what the youngsters can muster up this year. Back court: Dominic MacArthur will be given all he can handle as the centerpiece of this rebuilding program. The former JV Prep player looks to lead his young team and steer them in the right direction. Fellow junior Elijah Lyons brings experience to the team and figures to be a key part of the back court rotation. If this were a singing competition, Lyons would have the championship trophy already given to him. Let’s hope he can sing his way to at least a few wins this year. Matt DeMarco also has a chance to make an impact. Better known for being a 2x state champ on the tennis court, he is athletic and skilled enough to make a difference right away. Lastly, Jimmy Lynch looks to make an impact on the defensive side of the ball using his athleticism. Front court: Both Tim Klebanski and Matt Berry will be charged with holding down the paint this year for the Dukes. Skill isn’t exactly a word to describe their games, but the energy, toughness, tenacity, and confidence they bring to each and every game shows up. Both lack in height, so it will be a major challenge for them to get to involved in the games. Joe DeMarco will team up with his brother, bringing leadership as the lone senior. Analysis: Ms. Lion will be taking over the reigns as head coach this year assisted by new Prep gym teacher, Mr. Schreffler. Schreffler is most known for losing in the intramural 3-on- 3 tournament just a few months back, and he may seek some vengeance on those players. Too bad it will be hard to come by with this team. It will be interesting to see what direction Lion takes this extremely young and talent-lacking squad. If CYO had a tennis team, these guys would be incredible, but this is basketball, so good luck Saint Pete’s. Again, be patient. It’s gonna be a tough go around for Dukes fans. But, there’s always next year…right? St. Luke’s renaissance begins this season. After not having a squad last year, the Crusaders look to march their way onto the scene. They bring in many new faces from years past and no one really knows what to expect from this group. It is reassuring to see the team re-emerge in the league, showing the growing interest in CYO. It is still a relatively young squad, but all in all, they should still be competitive come game time. Back court: Anthony Gulick (probably the best player ever) will team up with former Prep JV players Stan Kinecki and Alex Ruler to form the back court. This should easily be the most productive unit of this team considering how amazing Gulick truly is. They will be paired with Dante McLauren as well (not quite Gulick but he has some skills that could surprise people.) Joey Nicolia is a nice addition from Collegiate Academy as well and he has the ability to score in bunches (much like Gulick does whenever he is on the court.) Additionally, senior Max Malinowski looks to play a big role in the rotation. It’s been quite a long time since we’ve heard such an unproven group talk themselves up so much in the preseason. But, confidence is not the issue. Pure talent may be though. No one knows much about this back court other than the self-hyped Gulick. Front court: Depth will be an issue here all year long. Center Anthony Roth comes to town from Mercyhurst where he formerly played basketball. He’s a big presence, but stamina may be a lingering problem for this big man. The same could be said for junior Logan Brandel. Both front court pieces have size, and Roth has potential, experience, and ability, but mobility may be a problem. Expect the Crusaders to play a lot of small ball and really try to only keep one of their bigs on the floor at a time. Andy Samuels may emerge as a key piece as well as he brings size, physicality, strength, and athleticism. They may have the largest front court in the league, but teams tend to be going smaller these days, and Gulick may even have to play some center. Gulick at center shouldn’t be problem for him, however. Think of it much like Magic Johnson starting for the injured Kareem in the NBA Finals. Analysis: This is yet another team that looks primed for the future. They should be competitive this year, but don’t expect a big number in the win column. They have plenty of young talent that needs to be refined before being considered as a contender. A lot depends on their big guys and how they can move with the pace of their guards. The Crusaders need to play to their strengths if they hope to win anything this year. Don’t expect anything more than a middle-of-the-pack finish from St. Luke’s…not this year at least. Who’s on this team? Saint James seems to be the San Antonio Spurs of CYO. No matter what the roster looks like, never count them out. St. James has a winning formula. Put pressure on the offense and be disciplined against defenses. Every year the Panthers are contenders, and this season is no different. They lost some key pieces from last year’s dominant squad, but they have enough coming back to still make a run at the championship. They may not boast much depth, but St. James knows how to play together and really make their opponent’s nights difficult. Back court: As Joe Campbell goes, so go the Panthers. He is a consensus First Team All-CYO this season and is the engine that drives this team. Campbell is the leader and knows how to flat out win. His killer dance moves might lead to a few travels here and there, but he should have a great year. He finishes strong in the paint, can really stroke it from outside, has nice touch, and can run the offense. Christian Babo (who?) looks to make an impact next to Campbell as well. The Harborcreek track and field star has taken his athleticism to the gym and hopes to ignite St. James’ transition attack. Both Alex and Carter Clement, along with Cayden Lombard will be relied on for bench production. Front court: Not only does St. James boast talent from the guards, but big men Linden Hoover (who?) and Ryan Krusiewski are big time players. Krusiewski is a huge body down low and flashes of his brute strength from football can be seen on the court. He’s skilled around the basket and has a knack for the offensive glass. Hoover is longer and much more versatile. He can shoot it but also uses his length and height to have his way in the paint and on defense. Joe Campbell’s younger brother, John, looks to make an impact as well. It’s going be quite a difficult task following in the footsteps of Joe, but he’ll give it a shot. Analysis: Look for the Panthers to be competitive night in and night out. They are extremely well-coached and a disciplined club. The biggest “if” is depth. If a starter gets in foul trouble, the offense’s upside takes a huge dip. They need one or two steady contributors to come off the bench. Regardless, everyone hates playing St. James due to their tiny court, long commute, pressure defense, athleticism, offensive versatility, and patience. We don’t see that changing anytime soon. They can only hope to not crumble like they did last year against Saint Jude’s. Unfortunately, we are contractually obligated to cover St. George this year. St. George is easily one of the deepest teams in the league and has plenty of talent, like always. They lost major contributors Trey Dietrick and Charlie Lictenwalter to graduation, but they return plenty of talent, along with highly touted transfers to overshadow the losses. If everyone gets on the same page sooner rather than later, we’re talking about a tough out come playoff time. Back court: Again, we are legally bound to talk about the Lancers this year. But, they return John Lupo, Mike Bevan, Paul “Fats” Causgrove, and Mike Rahner. Lupo should have the ball in his hands most of the time, but Bevan is in the conversation for being the best shooter in all of CYO. Rahner could be a breakout candidate. After showing flashes of athleticism, shooting range, and guard skills, he could be in for minutes off the bench. Add in Fats Causgrove for more depth, and this is a very formidable back line. Transfer and All-State kicker Anthony Lupo will be among the starters this year. Despite being short in stature, he is tough, strong, competitive, and a menace on defense. Front court: Yes, we still have to write about their forwards. We apologize. For the first time in a while, the Lancers will be reliant on their front court. Despite no player standing even 6’0”, this should be one of the best units in the league. It all starts with senior Nick Wisinski and the energy he brings to each and every game. He’s penciled in as our Defensive Player of the Year and rightfully so. He is the best defender and can do it out on the perimeter or go to battle with big guys inside. He gets the job done and also makes plays on the offensive end. Wisinski will fight night in and night out and is a coach’s dream and opponent’s nightmare. Hopefully he will not foul out often. If he can control his emotions, we may be looking at the most valuable piece to this team. A teammate of Wisinski’s on the football field as well, Matt Lupo, will be wearing a basketball uniform for the first time since freshman year with Prep. St. George is lacking that go-to scorer, and Lupo may be the one to fill that void. He is very strong but needs to get acclimated to basketball once again. Seniors Noah Noble and Matt Zupan will finish off the front court. Noble will get the starting edge. He is extremely versatile and will throw up a lot of 3s. Noble will also be in charge of keeping the rest of the team in check. Saint George is full of players who have been known to be a little hot-headed, but Noble should be able to keep them together. He’s worked on diversifying his game. Standout Prep soccer player, Matt Zupan, will look to build off a successful grade school basketball career with the Lancers. Zupan is without a doubt the best player to ever touch a ball for Saint George, and many expect him to eventually take his talents to the big leagues. It’s truly amazing how unstoppable he is. Analysis: Last paragraph, I promise. Does this team look familiar to you? If it does, that’s because five of the seven best players return from the 8th grade team that made the run to states in 2014 for the Lancers. That team lacked true size, too. So maybe all these concerns are irrelevant considering they’ve gotten it done with this group before. Or, maybe some things have changed since then. Saint George will continue to stick with their grit and grind style of play that they have made so popular within their organization for so long. Anthony Lupo will be a pest on the perimeter, and when Nick Wisinski isn’t posting pictures of his girlfriend on Snapchat, he plans to make the paint a no fly zone. If John Lupo can step into the premier guard role and Matt Lupo shows flashes of his former basketball prowess, this team can compete with anyone in the state. After a season plagued by inconsistency, the Bulldogs seem to finally have all the pieces in place. Much of the pressure will fall on young head coach Tyler Smith. The talent is there for this year to be a big one, but it is contingent on how well the players mold around a new centerpiece and also how they react to playing within a disciplined offensive system. Back court: Senior Alex Welz started at point guard his freshman year before joining Prep’s JV team the following season. Alex came back and is hungrier now more than ever to steer his team to success. He will look to be the steadying force and leader behind the Bulldogs this year. Joining him in the back court will be former McWho JV starter Tyler Ackman. Ackman is one of the league’s best shooters who, when hot, can throw 30 points on the board. He will get his work exclusively from the off-ball guard spot. Look for coach Smith to draw plays up for him when he gets going. Alex Baldi is an athletic combo guard who will provide immediate depth and competitiveness off the bench for BS. He is a welcome addition to what’s been a depleted bench the last couple of seasons. We can just hope that everyone keeps their girls far away from this kid. Front court: The most notable newcomer is Adam Malesiewski. Malesiewski played JV basketball at Prep as a freshman and then suited up for varsity as a Sophomore. He is the best isolation scorer in CYO basketball and is a game changer for BS. This adds a much needed scoring punch to the Bulldog’s repertoire and gives them a true monster on the front end who can also initiate the offense. Although the starting front court may not be the largest in pure size, it more than makes up for it with brute strength, muscle, and heart. Seniors Hunter Orlando and Ryan Sargent make up arguably the best rebounding tandem in the league. Orlando may very well be the best rebounder in the league but is still raw in other parts of his game. Abba will give Orlando all the strength he will need every game. With Sargent at the 5, he is athletic enough to take advantage of mismatches with true, traditional bigs. If he can be more consistent, the Bulldogs have another matchup nightmare on their hands. Senior John MacKenzie will shore up the bigs and bring exceptional size at 6’5”. If he builds off of his rapidly improving post game that was so impressive down the stretch last year, look out. John’s political outtakes may be too much for opposing defenses to handle, and they could lead to easy buckets for the big fella. Analysis: With so much returning talent coming back, along with one of the two best newcomers joining them, BS is in good shape to turn some heads this year. If Welz or Sargent can step up as a consistent, reliable number two option behind Malesiewski, they could be lethal. The Bulldogs also need to ensure they play smart, disciplined basketball and remain unselfish. If they do all those things, and coach Smith gets the most out of his players, we’re talking about a championship caliber team…if they’re legal. Fresh off a ticket to the big dance in Allentown last season, St. Jude’s may be even better this year. Returning all but one starter, the “Jude’s Dudes” envision an even more impressive finish this year. They also brought in a big time transfer. However, they won’t be sneaking up on anyone this time around. Losing leading scorer Collin Williams to graduation shouldn’t leave any fans panicking, as Jude’s Dudes have plenty left over to threaten for a state title once again. Back court: James Proper returns as the assumed leader in the back court. Although he is one of the taller players in the league, Proper can play positions 1-5 and has our vote for most versatile player. Proper has the potential to be a dominant player in the league again after an impressive season last year. Let’s just hope he spends half as much time on the court as he does on his hair. He is freakishly long and will be disrupting many smaller guards out on the perimeter this year. Coming off a PCL tear, it was believed that senior Henry Fessler would still be up to the task of playing for the Dudes. Unfortunately, it just didn’t work out, as Fessler’s knee couldn’t hold up. Hopefully he recovers well from injury and continues to be the Dudes’ biggest supporter. Sophomore Collin Johnson is another huge pickup for this team, as he plans to live in his brother’s footsteps and become a major part of the Saint Jude’s basketball program. Juniors Dave Clark and Matt Zimmerman will team up with seniors Matt Leggiero and John Hagerty to provide depth behind Proper. Dave Clark is known for missing out on big opportunities. All are very capable shooters (even Dave). Of them, Clark seems to have the early edge for minutes right away. Front court: This is the strength of the St. Jude. Good luck grinding down low with the likes of Nick Carneval, Tommy Agresti, Jared Heidt, and Sean McEnery. Carneval, another new arrival, will be the largest player in the league and was a top player on the Prep freshmen team threee years ago. When Nick Carneval isn’t breaking a leg on stage, he plans to be breaking ankles on the court. He will be teamed up with Tommy Agresti. Agresti just finds ways to beat his opponents in ways that make the refs look at each other and shrug their shoulders, but he simultaneously makes opposing coaches break their clipboards in half. He does everything on the court. Heidt is the ultimate glue guy. He rebounds at a high rate, defends well, and hustles. Lastly, McEnery shows up in the big moments but also contributes in more ways than what the box score may indicate. Perhaps the most interesting depth piece will be Nick Maloney. Maloney is a tough scrapper who will look to get reserve minutes along with Albert Caldwell, who brings size. Maloney is a rock defensively, but offense may be an issue as he has trouble catching the ball. 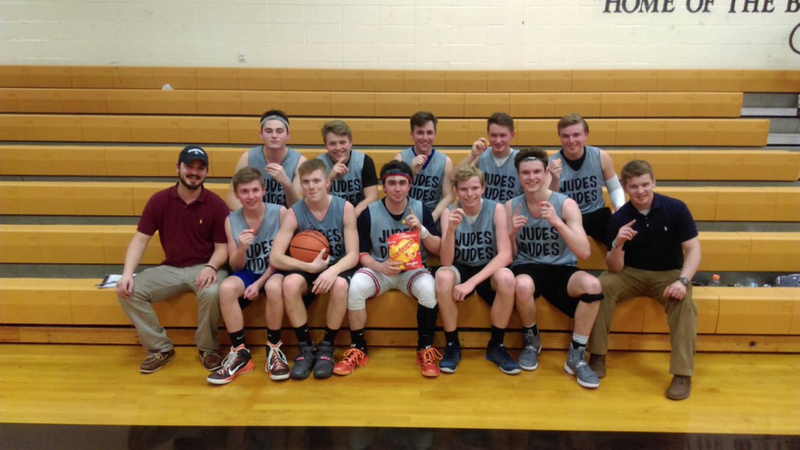 Analysis: This team has all the looks of repeating as CYO regional champions. But they shouldn’t feel overconfident just yet as the rest of the league is significantly improved as well. And, they didn’t exactly cruise to the tournament either. They had some hard fought games, and a lot of breaks went their way last season. However, they bring back their core and also hauled in two big time transfers. Everyone knows their role on this squad and plays within themselves. Time will tell how they hold up in the vastly improved league, but the door is open for another trip to the state tournament. Initially, expectations were set relatively low for the OLP Crusaders, a perennial powerhouse, coming into this season. Then, former Prep basketball players started pouring into the gym, and we may be looking at a very dangerous team now. Along with a couple holdovers from years past, OLP will need the newcomers to jell and figure out how to play together quickly. We should be in for a fun ride this year, so get ready for some exciting basketball. Back court: This unit looks to bring the swagger back to OLP basketball. The Crusaders boast arguably the best back court in CYO this year. Newcomers Ethan Rys and Marcus Lewkowicz both opted to join OLP rather than play for Prep this season. They are poised to become the class of CYO guard play and hope it leads to a successful season. They will be joined by sharpshooter Drew Bleggi and former McWho JV starter Quinn Baird. Baird is a solid all-around player who looks to log big minutes off the bench. Senior Joe Coppola adds depth to a loaded back court. Front court: As stacked as the guards are, OLP has the personnel to have a perfect compliment to them down low. Senior Alex Douds will be the best player in CYO this season. He is a dynamic scorer who boasts quickness, length, shooting prowess, finishing touch around the rim, and high volume scoring ability. He will be nearly impossible to stop from the moment he takes the floor. Hogging up the paint will be a committee of three capable big men. The first opportunity will most likely go to Chris Smith. More known for his play on the football field, Smith is a large body who is able to provide energy and toughness. Nolan Tupek provides additional interior beef while Senior Rob Harris plays with more finesse. He has a nice shooting touch and is very mobile for his size. Analysis: If what they say is true, that guards really do win games, then this squad should be in for one heck of a season. Filter in our Player of the Year, Alex Douds, and this is easily the most explosive team in the league. If the newcomers all blend well together and play team basketball, look out. The big guys are tough, each bringing their own unique skill set to the table to. It all comes down to chemistry. If this group can put it all together, there really isn’t an identifiable weakness here. This OLP squad looks incredible on paper, but many believe they will not mesh well on the court. Locker room problems are bound to arise, and no one seems to have stepped up as a leader for this club. Sorry OLP, but Joe Mischler can’t save you this time. Douds is a new player to CYO with an all around skill set that will fit perfectly in the modern game. With his size, length, and skill, along with his silky three ball, he has all the makings to be the best player in the league. Malesiewski is maybe the most dynamic scoring weapon in the game. He can do it from all three levels but prefers to stay in the box. Although not our vote for Player of the Year, he will certainly be in the conversation. Bleggi has a deadly three point shot that has progressed every season. After coming off of a strong performance behind the line last season, Bleggi has the ability to make a statement this season. Through the power of Abba and Ceen, Orlando is a monster on the glass. With his unorthodox rebounding methods and brute strength, Orlando will be the physical presence Blessed Sacrament has been boasting for years now. This seemed like the obvious choice here. Wisinski has been cooped up behind Mischler for too long as the backup quarterback, and he plans to take his frustrations out on the basketball court. With his unpredictable temperament and knack for pestering opposing players, Wisinski will rule the league on defense for Saint George. Proper has everything you want in a modern day point-forward. His court vision is one of the best we have ever seen, and he can score from anywhere on the court. With his height and long wingspan, Proper can play all five positions on the floor. Anyone who has ever seen an NBA game should know this one. Maloney has everything it takes to play at the next level. He is an athletic rim protector who can draw fouls like no other with his impressive flopping ability. Expect to see Maloney in the top five come next draft. Agresti is a wizard on the court. Blink and he’s at the rim. He has blazing speed, and with his peculiar shot selection and unusual play style, he never fails to amaze. Agresti will constantly excite crowds. After an incredible underdog story last year, Squiggs is poised for another run as the top coach. He is a player favorite and inspires his team to have fun. Squiggs is a coach every team wishes they had. Alex Douds can score at all 3 levels with the best of them. His length causes problems on defensive end. Joe Campbell is the most important player to his team. He does all the little things right both on and off the court and is the ultimate hustler. Adam Malesiewski is an elite iso scorer and may be BS’s missing piece. Tommy Agresti‘s play is defined by three words: somehow, some way. James Proper is a long, lanky senior who may be the most versatile player in CYO. Hunter Orlando may very well be best rebounder in the league. John Lupo will most likely be best player on an always competitive Lancer squad. Nick Wisinski potentially makes the most all-around, individual defensive impact. Think Draymond Green. Marcus Lewkowicz may be heavy contributor in the best offense in the league. Alex Welz looks to bring consistency back to the Dog Pound and set talented teammates up. Ryan Sargent had a few huge games last year. His shot consistency is key. Sean McEnery is a clutch stretch 4 who played a crucial role down stretch en route to last year’s state tournament appearance. Anthony Lupo is a pesky guard who will get in opponents’ heads and play hard. Ethan Rys is a gifted guard who will look to be more of a team player with so many weapons surrounding him. Matt Lupo looks to follow up a stellar Prep football career with a strong showing on the court.